Are you a graphic designer, web designer, architect, interior designer, electrician, builder or from another profession? Either way, you can use your previous projects to attract new clients. A password protected portfolio lets you publish examples of your work on a WordPress website, while hiding parts or all of it from public view. You can give potential clients the password to your portfolio, while maintaining the confidentiality of your projects and previous work. Lots of people have a public WordPress website and use a third party portfolio provider to securely share examples of their work online. Hosted third party portfolios are expensive. They’re also less professional because they don’t match your website. You can save money and get a better result by creating a password protected portfolio in WordPress. Your main website content and your portfolio will be managed via the same WordPress admin area. It’s simple, efficient and works a treat! This is the complete guide to creating a WordPress password protected portfolio. I’ll talk you through 3 easy ways to protect your whole portfolio or just parts of it. The rest of your website will remain available for anyone to view, but your portfolio projects will be hidden and password protected. And here’s a fun quiz to help you decide which method is best for you. Should I password protect my portfolio? Let’s start with the question of whether password protected portfolios are actually a good idea. There are plenty of people in both camps. Some want to keep parts or all of their portfolio private, protected from public view. Others prefer a public portfolio that anyone can see. Here are the main reasons for and against – read these and decide whether or not to password protect your portfolio. You might have confidential, white label or proprietary projects under an NDA. Or maybe you have clients who aren’t happy for the world to know that they use your services. Either way, a password protected portfolio lets you showcase your work to potential clients without compromising your existing clients’ confidentiality. If you’re concerned about copyright issues or people stealing your work, a password protected portfolio keeps your content safe. Password protecting your portfolio hides your work from competitors. They can’t see your methods or try to compete by copying your style. Tip: A password protected portfolio isn’t a guaranteed way to protect your clients’ confidentiality. You should still get their agreement to be included in your private portfolio, even only people with the password can see it. Your portfolio is a way to showcase your work to the world. This adds credibility to what you do, reassuring people about your skills and ability. This makes them more likely to use your services. Password protecting a portfolio hinders this, as new visitors to your WordPress website can’t see your work. The decision on whether to create a password protected portfolio depends on the nature of your work and your clients. If your work isn’t commercially sensitive then you should ask certain clients if they’re happy to be included in your public portfolio. If this isn’t appropriate, create a WordPress password protected portfolio instead. The ideal compromise is to have a public portfolio to showcase your non-sensitive projects or case studies, with a password protected section for work you can’t share publicly. That way, new visitors can see your fantastic work. After they make an enquiry and progress further towards becoming a client, you can share the password protected portfolio projects with them too. All WordPress websites include a feature to password protect individual pages or posts. This includes ‘Portfolio’ posts, if you have them. Go to the ‘Edit’ screen for the portfolio item you wish to password protect. Find the ‘Publish’ box in the top right corner. Click the ‘Edit’ link next to ‘Visibility’. Choose ‘Password protected’, add a password and click ‘Ok’. Click Update/Publish to save the portfolio post. When anyone tries to view the password protected project in your portfolio, they will be prompted for the password. While you can password protect as many portfolio posts as you like, they all work independently. This means that even if you choose the same password for each one, your clients will have to enter a password EVERY time they want to view a protected portfolio project. If they’re viewing multiple projects then this creates a bad user experience. 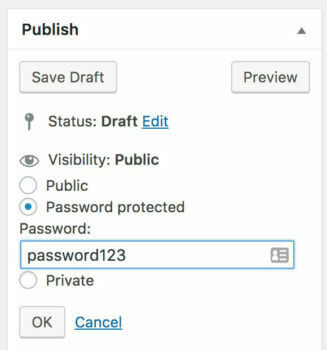 Password protecting a portfolio post in WordPress doesn’t affect its visibility on your public website. Anyone can see it (including the title, which may include your clients’ name) but they have to enter the password to view the content within. Your password protected portfolios will appear in search results, the built-in WordPress search, and on your main portfolio page if you have one. The whole reason for password protecting parts of your portfolio is to protect client confidentiality, so this is counter-productive. Mixing up public and password protected portfolio projects also creates bad user experience for your public visitors. Imagine if you were a normal visitor to your website looking for examples of your work. Sometimes, you would click on a portfolio item and be able to see it. Other times, you would be asked for a password. You would have know way of knowing what to expect. This would be quite off-putting and would deter potential new clients. So, this is a simple way to create a password protected portfolio. However, the results aren’t ideal for any of your visitors. It’s worth spending a few extra minutes implementing methods 2 or 3. We’ll look at these next. Methods 2 and 3 both use the same plugin. They’re just set up in different ways depending on whether you want to hide some or all of your portfolio. The plugin to use is WordPress Password Protected Categories. This simple but effective plugin lets you password protect any category of WordPress content, including portfolio categories. Password protecting a portfolio category is better than protecting individual posts (see method 1) because entering a single password will unlock all projects within a category. 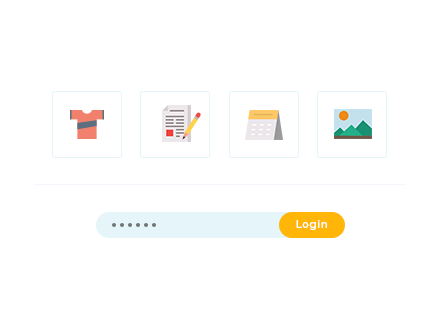 The plugin lets you hide your protected portfolio projects and categories from other parts of your site, so public visitors won’t accidentally end up on the password entry page. By using Password Protected Categories, you won’t fall foul of any of the downsides of method 1. Get Password Protected Categories, download the files and copy your license key. Upload the files and activate the plugin. Go to Settings > Password Protected Categories, enter your license key and change any settings. For example, you can customise the wording on the password entry page. You can show or hide your protected content in public areas of your site. I recommend hiding it for a WordPress password protected portfolio. Go to Portfolio > Categories (or wherever you edit your WordPress portfolio categories). Next, go to add or edit your main portfolio category. Your entire portfolio – including any sub-categories – will sit under this password protected category. You’ll see a new ‘Visibility’ section added by the Password Protected Categories plugin. Click ‘Password Protected’ and choose a password. Add 1 password if you want everyone to share a password. Add multiple passwords if you want each visitor to have a unique password which you can then revoke after a limited period to remove their access to your protected portfolio. (Optional) If you need to divide your portfolio into sub-categories, create them now. Leave the Visibility set to ‘Public’ and set your password protected category as the ‘Parent’. The plugin will automatically protect your portfolio sub-categories and their posts with the same password. Finally, go to the ‘Portfolio’ section in WordPress (or wherever you edit portfolio posts). Use ‘Quick Edit’ to add each post to your password protected category or one of its sub-categories. (Optional) Add links to your password protected portfolio category. Anyone who visits your website can see your normal pages. If they click a link to your password protected portfolio category – or of its posts or sub-categories – they will be prompted for the password. After entering the password, they can navigate to other portfolio pages without having to re-enter the password. The Password Protected Categories knowledge base contains more information about the options for your password protected portfolio. Method 3 also uses the Password Protected Categories WordPress plugin and has the same benefits. The difference is that I’ll show you how to set it up in a way that hides specific areas within your portfolio, while leaving others public. This is a good option if most of your portfolio can be public, but you want to add a few projects that need to remain private. I’ll show you how to set it up so that you can have public and private areas within your portfolio, without compromising on user experience. Create a password protected portfolio on your WordPress site now! Buy Password Protected Categories, download the plugin files and copy the license key. Upload the plugin files, install and activate it. Navigate to Settings > Password Protected Categories. Enter your license key and change any settings, such as customising the password entry page. Choose the setting to hide your protected portfolio content in the public areas. Next, go to Portfolio > Categories (or whichever section you edit your portfolio categories in WordPress). Create 1 or more categories for your public portfolio. Leave the ‘Visibility’ option set to ‘Public’. Now create 1 or more categories for your private portfolio. Set the ‘Visibility’ to ‘Password protected’ and choose 1 or more passwords. Go to the ‘Portfolio’ section in WordPress (or wherever you edit portfolio posts). Use the ‘Quick Edit’ option to categorise your projects. Finally, go to Appearance > Menus and add links to your portfolio categories as required. You’ll definitely want to link to the public portfolio, and may or may not link to the private area. See the below tips on linking to your private portfolio. To protect multiple portfolio categories within a single password, create a password protected ‘Parent’ category. Add as many sub-categories as you like. Leave the Visibility of the sub-categories as ‘Private’ as they will automatically be protected using the same password as a the parent. That way, visitors can navigate between multiple categories without having to re-enter any passwords. Alternatively, you might want to create separate password protected portfolio categories which different people can access. For example, you might create a password protected portfolio for each industry that you cover, and give potential clients access to the portfolio for their specific industry. To do this, create several standalone categories and password them all individually. If you accidentally add a project to a public and a private category, it will be password protected. It’s best to avoid doing this – keep your public and private case studies separate. So far, I’ve shared 3 ways ways to password protect a portfolio in WordPress. That may be all you need, in which case you can stop reading now. Or if you need extra tips on how to create a WordPress portfolio, keep reading. Use normal WordPress posts. If you’re not using the ‘Posts’ section of your WordPress website for anything else (e.g. 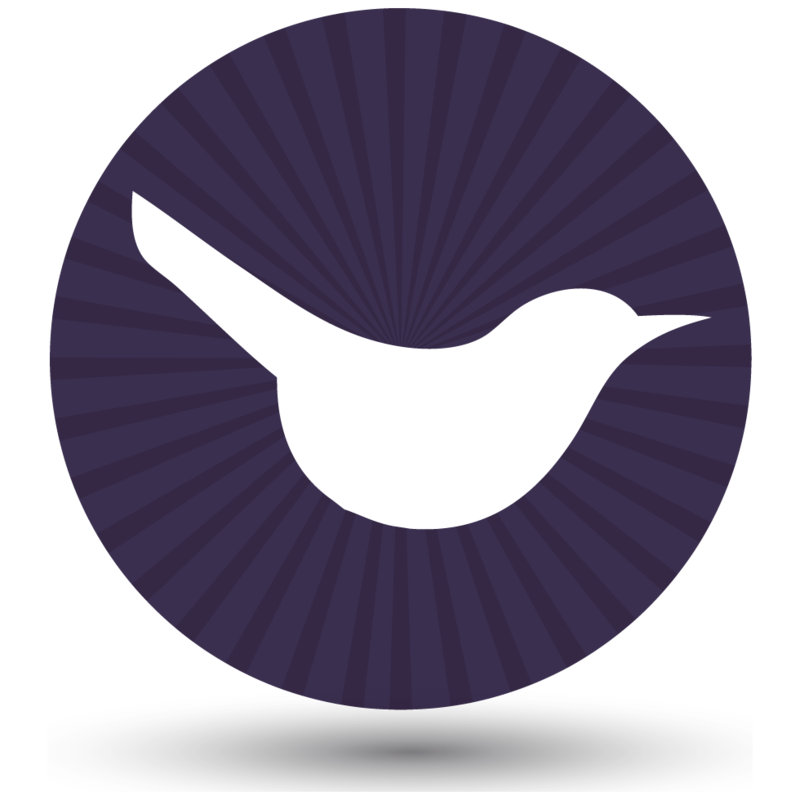 Blog or News) then you can use it for your portfolio. Add each project as a separate post. You can then use the blog layouts available in your theme to present your portfolio in eye-catching ways. You can also divide the portfolio into categories etc. Use your theme’s ‘Portfolio’ post type. Most WordPress themes come with a ‘Portfolio’ post type, which you can find by looking for the ‘Portfolio’ link in the left of the WordPress admin. This will be designed to specifically to work as a portfolio, with one or more layouts for showing off your work. Use a portfolio plugin. If your theme doesn’t come with a portfolio layout then you can add this using a plugin. Elegant themes have written an excellent article on the best WordPress portfolio plugins. The disadvantage is that the portfolio layouts may not match your theme, so a bit of custom styling may be needed. Create a ‘Portfolio’ custom post type. You can also create a ‘Portfolio’ post type yourself using a plugin such as Custom Post Type UI (or programmatically if you’re a WordPress developer). This is a nice lightweight option as you’ll only end up with the features you actually need. 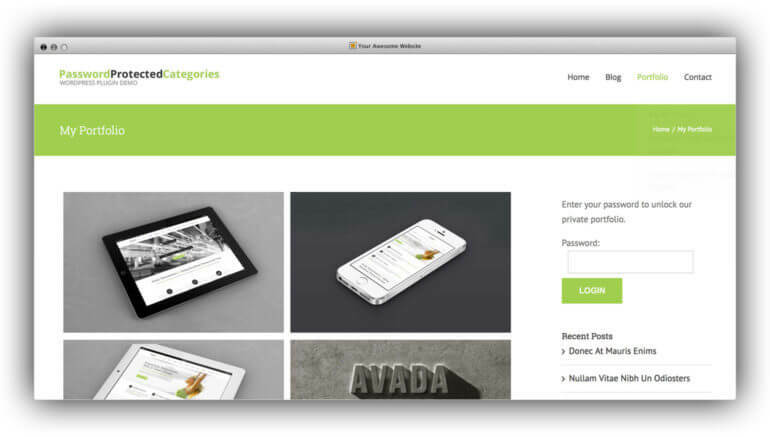 However you will need to create your own templates and layouts for displaying the portfolio categories and posts. Whichever of these methods you choose, you can use them all with any of the password protection options mentioned in this article. How should I link to my WordPress password protected portfolio? If you’re password protecting individual portfolio posts then this doesn’t apply. If you’re protecting parts or all of your portfolio then you need to decide how to include it in your website navigation structure. Link to your private portfolio from the menu. If you’ve unticked the box to show your protected portfolio content in the public areas of your site, you need to do this by adding a custom link. Don’t select the category from the list in Appearance > Menus as the plugin will hide it until someone enters the password! A custom link will appear to public users so get the link for your protected portfolio category and add it in this way instead. Add a login form somewhere on your public site, for example the sidebar. If you’re using the Password Protected Categories plugin then you can do this by adding [category_login] to any text area on your website. Add a subtle text-based link to your password protected portfolio category or private portfolio page anywhere on your website. For example, you might add it to the header or footer. Keep your private portfolio hidden from public view. When you want to give someone access, email them a direct link to your password protected category along with the password. They can view your hidden portfolio without anyone else knowing it exists. Finally, it’s worth noting that since you create the passwords on the Portfolio Categories page, the usual tricks to recover a lost password in WordPress don’t apply. This is because the portfolio passwords are linked to the category, not individual WordPress user accounts. If you feel you need a lost password link, add this to the password entry page so that people can contact you to request a password. I hope this article has helped you to decide the best way to create a password protected portfolio in WordPress. We’ve covered easy ways to make your whole online portfolio private or just parts of it. You’re not limited to using Password Protected Categories plugin for a private portfolio. You can protect any type of WordPress content that uses categories. Experiment with creating a password protected blog, protect e-commerce products using plugins such as Easy Digital Downloads, and more. Do you have hidden portfolio projects on your WordPress website? Which method do you use? Do you think that private portfolios give customers a good or a bad impression? Leave your comments below. 2. On my portfolio site, instead of a landing page with a gallery of each portfolio project, users will simply use the site navigation to move from project to project. The entire portfolio section of my site will need to be password protected (essentially, one item on the primary nav). When a user selects "Portfolio" from the primary nav, I'd like them to see the password page, and then gain access to all the child pages in the Portfolio section. From your demo, it seems as if this will be possible, but I just want to make sure. 3. In terms of the development process/workflow, when is the best time to apply this plug-in functionality? Once all my pages are built, or as I'm building these pages? Thanks again for demonstrating this great plug-in! Hi Jeremy, thanks for your questions. 2. Yes, that is how it will work. You need to create a password protected 'Portfolio' category. All your individual portfolio items (which you refer to as pages) should be posts within the portfolio category. 3. It doesn't make much difference when you install the plugin. I suppose it's slightly easier for you to install it straight away and create your password protected Portfolio category. You can then add your individual portfolio posts to that category as soon as you create them, instead of having to go back into each one later and add them to that category. But it will work fine either way. Interesting, topic you discussed here, these tips will help to make password protected portfolio website. Thanks for sharing your experience here. Thank you for these easy steps. I will try to do this.